Brahe received an excellent education. At the age of 13 he entered the University of Copenhagen, where he studied rhetoric and philosophy. He was well on his way toward a career in politics when he witnessed an eclipse of the Sun on August 21, 1560. Brahe spent the next two years studying mathematics and astronomy. He moved on to the University of Leipzig in 1562 where a tutor tried to influence him to study law, but Brahe refused to be diverted. In August 1563, he made his first recorded observation, a close grouping between Jupiter and Saturn. (It was not until many years that Galileo first used a telescope to make astronomical observations; Brahe's precise work was done with the naked eye.) This was the turning point of his career. He was perturbed to note that this event occurred a month before its predicted date, and he began to buy astronomical instruments that would allow him to make very precise measurements so he could produce more accurate tables of data. He also developed interests in alchemy and astrology (which he very mistakenly considered a science) and began to cast horoscopes that, if nothing else, at least generated some income. In November 1572, a supernova burst into view in the constellation of Cassiopeia, and Brahe was enthralled. The new star became brighter than Venus and was visible for eighteen months. He described it (along with its astrological "significance") with such detail in a book, the new star became known as "Tycho's star." The book did three things: the title De Nova Stella ("Concerning the New Star") linked the term nova to all exploding stars. In addition, Brahe had been unable to make a parallax measurement for the nova. That indicated that it was much more distant than the Moon, which was a crushing blow to Aristotle's teachings that the heavens were perfect and unchanging. The third accomplishment was in establishing Brahe's reputation as an astronomer. The book was almost not produced. Initially, Brahe felt it was beneath his dignity as a nobleman to publish, but he was soon convinced otherwise. Brahe's arrogance was legendary and managed to anger nearly every person with whom he came into contact. At the age of nineteen, he was involved in a duel over a mathematical point, during which he lost his nose. He spent the rest of his life wearing a silver prosthesis. Fortunately, one of the few individuals not alienated by Brahe was Frederick II, the king of Denmark. In 1576, this patron of science gave Brahe a small island called Hveen, subsidized the building of an observatory there, and endowed Brahe with an annual payment. This became the first real astronomical observatory in history, and Brahe, always mindful of his noble background, saw to it that no expense was spared. The principal building, Uraniborg (Castle of the Heavens), was the main residence; next to it was built the main observatory, Stjerneborg (Castle of the Stars). In 1577 a bright comet was visible, and Brahe observed it with great care. Measurements showed that it, too, was further than the moon and could not be an atmospheric phenomena as Aristotle taught. Worse, Brahe reluctantly came to the conclusion that the path of the comet was not circular but elongated. This meant it would have to pass through the "spheres" that carried the planets around the sky, which would be impossible unless the spheres did not exist. This concept was personally troubling to Brahe, who rejected the Sun-centered theory of Nicholas Copernicus because it not only violated scripture, it contradicted the teachings of the great Ptolemy. Brahe also reasoned that if Copernican theory was correct, he should have been able to detect stellar parallax as the year passed, but he could not. 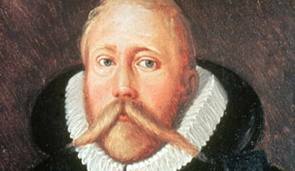 Brahe tried to reconcile his beliefs with his observations by proposing a solar system in which all the planets orbited around the sun, but the Sun orbited around the Earth (to account for a year), and the celestial sphere made a single rotation each day. This would follow Copernicus's theory, do away with the Greeks' planetary spheres, and still keep the Earth at its preeminent position. The Tychonic Theory was almost entirely ignored. Frederick II died in 1588. His son, Christian IV, was only eleven, so the country was ruled by regents, who left Brahe to his own devices. When Christian came of age in 1596, he quickly lost patience with the expensive, haughty astronomer, and Brahe was relieved of his royal duties the following year. Brahe moved to Prague, where he resumed observing. As an assistant he employed a young German named Johannes Kepler, to whom he gave all his observations on Mars and the task of preparing tables of planetary motion. This would turn out to be the most significant decision of his life, as Kepler used the data to determine the elliptical nature of planetary motion. Brahe died in 1601.